A well-organized army of criminals takes San Francisco’s financial district by storm, emptying the vaults of the city’s largest banks, then disappearing without a trace – all within minutes. The bullet-ridden corpses of the robbers begin turning up soon after – apparently the mastermind has decided to keep all the loot for himself, rather than splitting it 150 ways. Blood Money is considered by many Hammett scholars to be Hammett’s true first novel, predating Red Harvest by two years. 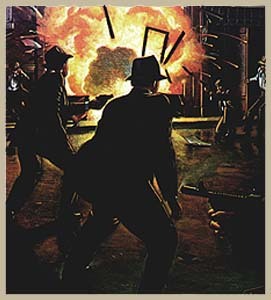 It originally appeared as two short stories in Black Mask in 1927 under the titles “The Big Knockover” and “$106,000 Blood Money.” It was not presented as a single novel until 1943, when it appeared both in softcover and cheap hardcover editions. However, since 1966 it has again been split into two stories. So... is Blood Money Hammett’s first novel or not? I won’t commit myself one way or the other, but I will say that Hammett apparently didn’t consider it so. In the mid-1930s he rejected plans for his publisher to release it as his latest hardcover novel; he judged it a sub-par effort, not worthy of salvage. Most Hammett fans would strongly disagree. In addition to being action-packed, Blood Money makes an excellent lead-in to Red Harvest. Here are the seeds of the Op going “blood simple” in the later novel, being so immersed in violence that he begins to embrace it, even relish it. Perhaps best of all is Hammett's roll-call of rogues: a seemingly-endless list of the most outlandish nicknames ever assembled in one place, including Alphabet Shorty McCoy, Toby the Lugs, The Shivering Kid and... well, you'll want to read the rest for yourself.